Our wedding website offers a brand new feature, You can create an even more personal experience by registering with your very own domain name. 1. I am a registered premium user and I want to create my new custom domain? Is there additional costing involved? Yes, we can create this for you. This will cost you an additional 599.00 INR to register the domain and also map your existing invite URL to your own domain. 2. What is the validity of my custom domain name? 3. How much will my personal domain cost? Each personal domain costs 599.00 INR which includes domain registration, hosting process, set up process, and maintenance for 12 months. 4. What do I get when I purchase my personal wedding website? 5. What is the waiting period to see and share my wedding website link? Your website is our priority. You will have your website up and running in a maximum of 12 hours from the time of registration. 6. I've already sent my free wedding website address to my friends and family. If I buy a personal domain, will that link still work? Yes, that link will continue to work. However, you can also share your new wedding website link to your friends and family. 7. I searched for a domain, but the domain name I want is taken! Is there any way to get it? We can always discuss alternatives. Please contact us for this. 8. 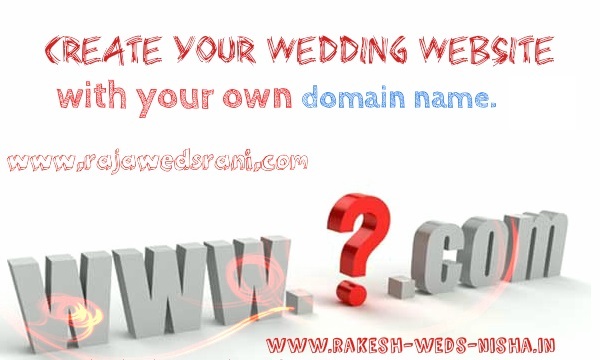 I already own a domain that I would like to use with my Personal Wedding Website. Can you set that up for me? You will need to set up "domain name forwarding" through your registrar. To do so, you will need to contact or log into your registrar's domain management tool to redirect your own domain to your personal wedding website free address. 9. The domain I registered isn't the one I want! Can I get my money back? We register the domain only after your approval. Hence, we will not be able to refund this. In case you want to register another domain, we would be most glad to help you. It is your wedding, your website. Please feel creative to suggest what website names you would like and we can register this for you. 11. Do we have Control panel, FTP Control for this domain? Since we charged only domain cost, you will receive only your domain name.